The youth city is a state-of-the-art sustainable development designed and engineered to function independently from the city. It includes its own district cooling and heating, sewage and water treatment plants. The highly efficient system paired with vast amounts of onsite renewable energy generation will aim to produce as much energy as it consumes. The incredibly rich architectural background goes back to 1955 when Le Corbusier was invited to design a sports city for Baghdad. From Le Corbusier plans for the city, only the Gymnasium was realized and stands today as part of the new Youth City masterplan. 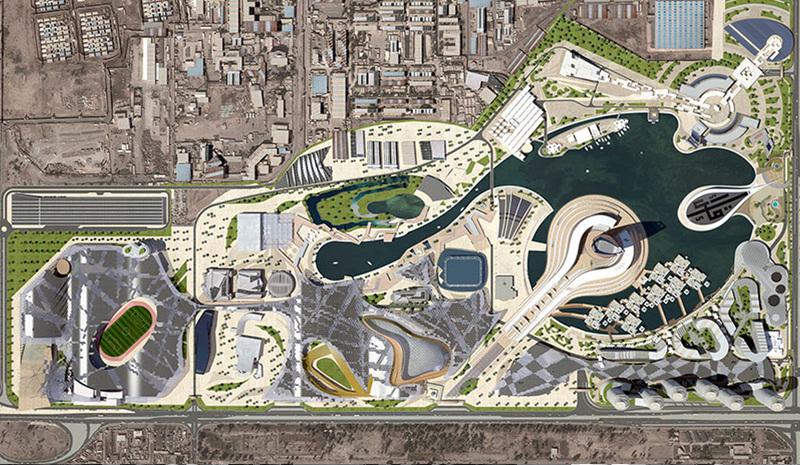 The sports, leisure and educational amenities will be linked by a distinctive landscape surrounding the new re-shaped artificial lake and flexible "modular" PV canopy. The groundbreaking strategy consists of different size modules that interlock.The ability to expand at will gives the opportunity to different ownership plots to join the oversailing structure and "design" its configuration once over their boundaries to suit.